Caciucco di Cecino Rosa di Reggello is one of the most fundamental dishes from the tradition of Tuscan gastronomy. 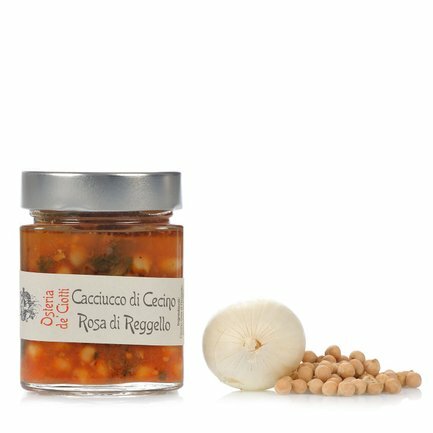 The recipe is made starting with natural ingredients, with the main ones being: the rare chickpeas from Reggello in Pratomagno, small but extremely flavourful beans that are grown by a limited number of producers. In order to enjoy caciucco at its best, heat it up in a pan, adding broth or water to taste. Serve it with toasted slices of bread and grated cheese. Ingredients Chick peas, organic tomato, onions, chard, extra virgin olive oil, chilli pepper, garlic, salt and pepper. Allergens: For more information on product labels, please contact our Customer Service department. The information on the labels of the products may vary for reasons beyond our control, therefore, there may be discrepancies between the information on the site and that on the products delivered. Please always check the information on the product before consumption or use.